Installation | America Pavers Contractors, Inc.
Where there is only pedestrian traffic a base of 4″ – 6″ of processed gravel is recommended. 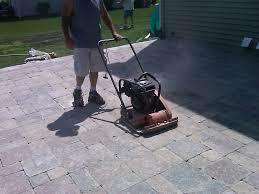 To achieve this excavate 7″ – 9″ to allow for the base material, sand and pavers. Where there will be vehicular traffic or around pools a base of 6 to 8 inches of processed gravel is recommended. 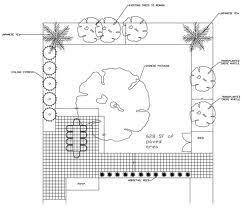 To achieve this, excavate 9 inches 11 inches deep. 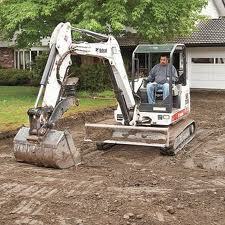 Make sure to excavate 12 ” beyond the area you plan to pave. 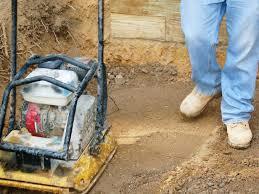 Compact the surface of the excavated soil with a plate compactor. In small areas a hand tamper maybe sufficient. 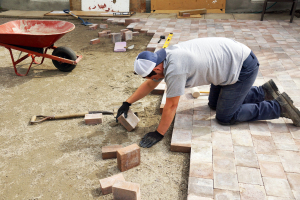 Fill the area with three quarters of an inch minus crushed stone or aggregate approximately 5 inches thick. Compact this with the plate compactor. Wetting the gravel lightly with water will help with the compacting. When you can walk on the gravel without causing an indentation you can add the next layer of gravel and compact it. 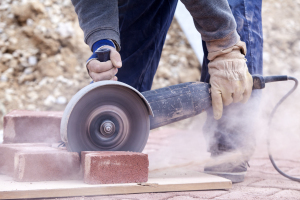 Continue to add gravel in layers until the base is approximately 3″ to 3-1/2″ from the desired level of the finish grade. Make sure to slope the surface for water drainage. The slope should be 3/16 per foot. Install a level line across the area using line level. On the stack that is at the end you want to slope towards, move the line down 3/16 of an inch for each foot the pavement. 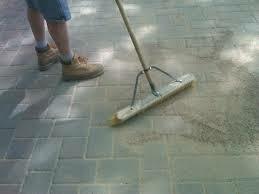 For example, if your pavement will be 8 feet long move the string down 1 inch. Measure the distance from the line to the base. The distance should be equal all along the line. For example if your payment will be 8 feet long, move the string down 1 inch. Measure the distance from the line to the base. The distance should be equal all along the line.